Love Moon Anion Sanitary Napkins / Pads Love Moon - Anion Sanitary Napkin (Pad) is a tech product in this modern world, the Anion (Negative Ion) Chip in Love Moon Anion Sanitary Napkins can release up to 5,800-6,070 Negative Ion (Anion) per cubic cm. The intensity of Negative Ion (Anion) released will effective suppresses the survival and multiplication of bacteria on the sanitary napkin. 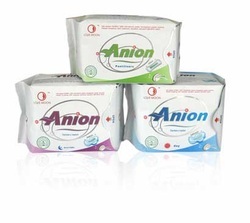 Anion (Negative Ion) in Anion Sanitary Pads can help regulate body functions such as antibacterial capabilities, deodorization, through purely physical processes. Love Moon Sanitary Napkin is the first and only hygienic antibacterial sanitary napkin in the market today. Helps women to prevent bacterial multiplication, eliminates odor and promotes comfort during menstrual period. * Most sanitary napkin are made from Bleached and Recycled Papers? * Most sanitary napkin may cause rashes, inflammation and even Urinary Tract Infections (UTI)? * Most Women are prone to a lot of Bacterial / Vaginal infections during their Menstrual Period? Anion (Negative Ion) on the Love Moon Anion Sanitary Napkin able to suppresses the survival and multiplication of bacteria on the sanitary napkin. Anion in Love Moon Sanitary Napkin release up to 5800 negative ions per cubic cm which has been proven in numerous scientific studies to protect against genital diseases, eliminating harmful bacteria, odor, enhance comfort and improve your health. The surface layer of Anion Sanitary Napkin is made of thin silk and soft cotton materials to keep the delicate skin dry and comfortable. The middle layer of Anion Sanitary Napkin contains highly effective super strong absorbent agents that can turn the liquid discharge into a jelly-like state to eliminate the sticky feeling. The base layer of Anion Sanitary Napkin is made of air permeable materials that allow diffusion of water molecules in the gaseous state to rapidly drive away moist air, thus effectively reducing moisture and heat between the napkin and the skin to maintain a dry and comfortable feeling. The padding in each Anion Sanitary Napkin is embedded with an Anion Chip that can release high density anion (Negative Ion) to help regulate body functions,such as antibacterial capabilities, deodorization, through purely physical processes. There is no side effect. Love Moon Anion Sanitary Napkin has an absorbent layer. This is made of highly effective and super strong absorption agents as well as leak-proof materials through a special high-tech process. When the liquid discharge comes into contact with the layer, it is absorbed such that there is no back flow or leakage. This will ensure a comfortable feeling and convenience in movement. 5. Patented Vaginitis Self Test Card provided free of charge can be used for genital health check. Seven Layers Of Protection for Love Moon Anion Sanitary Napkin First Layer Premium soft cotton surface, double absorbency. Third Layer Sterilized and dirt free paper. Forth Layer Plant extract as premium water absorbents with strong liquid retention. Fifth Layer Sterilized and dirt free paper. Sixth Layer Breathable bottom layer that allow free-flow of air. Seventh Layer Easy to peel off, fold lines adhesive design (food grade gum). The Negative Ion Chip (Anion Chip) in each piece of Love Moon Anion Sanitary Napkin can release up to 5800-6070 Negative Ion (Anion) per cubic cm. The intensity of Negative Ion (Anions) released will effective suppresses the survival and multiplication of bacteria on the sanitary napkin. Certificates, Awards and Test Report for Love Moon Anion Sanitary Napkins Certificates and Awards for Love Moon Anion Sanitary Napkin (pdf file) from China, Hong Kong and Malaysia.